If you are the owner of a Peugeot 307. Then if you’re DMF( dual mass flywheel) starts to play up on you. Thus, you may like to know.That an alternative solid flywheel and clutch is available. Hence, as a cheaper replacement. We at Pellonautocentre here in Halifax UK recently did just that. Consequently, one of our customers asked us to road test his car. Because he suspected that his clutch was on the way out. As a result, sure enough it had gone.Unfortunately, when we checked the clutch out. The car had a Dual Mass Flywheel clutch fitted. We gave the customer the choice. However, I think the fact that it was going to cost him much less for the solid flywheel. Swung it in the solid flywheels favour. The standard one was fitted. Finally, the job was completed. Afterwards, the customer went away a bit better off and very happy. After looking into this a little bit further. Mainly into Peugeot forums on the internet. I discovered that most forum contributors. Subsequently, say that it is all-right to carry out this conversion with only a couple saying to stick to the original Dual Mass Flywheel system, it is a case of “pay your money and take your chance”. Dual Mass Flywheels were invented to smooth out gear changes on diesel cars, I think this was originally in Germany by BMW in association with LUK clutches. On the same day we had a lady motorist turn up complaining that her Toyota RAV4 would not pull very well and there was a rattling noise coming from underneath her car these were typical Dual Mass Flywheel Symptoms . We put the car on a ramp (lift) and sure enough the car had a broken Dual Mass Flywheel. Because the car was not performing well with a suspected Dual Mass Flywheel Failure, the lady decided not to go for a cheaper replacement and we went on to fit a new LUK full DMF replacement. The car and the lady owner went away a happy customer knowing that we had cured her Toyota RAV4 Problems. This just shows two sides of the story, one guy wanted a cheaper job doing on his Peugeot 307 and the Lady wanted the correct replacement for her RAV4, it is always good to give the customer the choice. I must admit that I am not one of those drivers. Hence, who drive miles to fill their cars up at a supermarket. As a result, then I have only filled up in two supermarkets all my life. In terms of consumer advice. Then I would like to take this opportunity to advise you. Thus, to shop around and look at all the incentives the different supermarkets are offering. Including their petrol offers. Taking advantage of these over the next few months. Of course I will not be taking my own advice. Perhaps this is because I never do any of the family shopping. In fact we buy most things online. Including the supermarket shopping? In general though,you should take into consideration not only fuel prices from the supermarkets. But your standard weekly shop price. So as to compare the savings you could potentially make. I think that I have this thing about not buying from a supermarket. Because, I do not believe in “something for nothing”. This attached article sort of explains my theory. In fact with supermarkets continuously facing off with each other. Thus, lowering fuel prices. Then the consumer should feel the full benefit by receiving the best deal for them. As a business man, I cannot help feeling that the fuel prices are added onto all the other shopping items. Although I admit that I have no proof of this. Of course it is just a suspicion from a suspicious business man. In any case the pumps are always queuing with drivers eager to get their bargain fuel? After all we are a free country. So drivers should and will go where think there is a bargain? https://www.pellonautocentre.com/wp-content/uploads/2015/06/Logo_PellonCleanTrans.png 0 0 Eric https://www.pellonautocentre.com/wp-content/uploads/2015/06/Logo_PellonCleanTrans.png Eric2019-04-21 05:19:512019-04-21 05:19:51Supermarket Fuel-Supermarket fuel comes under fire is it truly saving you money? Women who know little about car repairs can make sure they aren’t being ripped off by their mechanic by simply suggesting a price for the work. So in general then I think that the garages who try to deceive female customers off. Of course, will be dishonest and also try to pull the wool over the eyes of all their customers ? men and women. “THESE GARAGES ARE A FOOL TO THEMSELVES”. So, our lady customers know when they are not been told the truth. Hence, if the price looks and sounds wrong then it probably will be wrong. We are members of Unipart Car Care Centres, and have regular Servicing tips meetings and contacts with other garages. It is our experience that our lady customers make up 60% of our total customer base. So, if a garage wants to keep this very important customer base then the ladies have to be treat in the correct manner. Believe me the ladies know what they are on about and would not go to the garage with their car that they did not trust. So, if they thought that they had been ripped off, they would not go back there a second time. Another addition to this story is that we now have an increasing number of female mechanics, with many Motor Mechanic Jobs going to females. Incidentally, who are just as competent as male mechanics and are probably more sensible. A strange thing happened the other day? a lady customer who was in for an MOT test asked us the price of a service to go with the MOT test. The lady agreed to the price and we duly did the work;The lady was happy with the job and the price paid and went home, satisfied. About an hour later the ladies husband rang us up and told us in no uncertain words that we had RIPPED his wife off. WOW. market, or will the car makers try to keep the cheapest car batteries to themselves. Certainly according to this report the customers want to buy their own Nissan Leaf Batteries and source them at the best price when they need replacing, at the moment i can not think past the post and can not imagine what the size of the battery market will be when the cars become second and third hand. At the moment we have a vibrant battery market, with many companies large and small having a share in the market ,but will this always be the case ?. Lithium-Ion batteries are now looking like the battery that will be used as the Nissan Leaf Batteries , along with other technologies, such as Hydrogen fuel calls. Another big development is with the Start-Stop car battery. You may ask How Does Stop Start Work?. This operates on the what you could call standard type vehicles and works by the cars engine being switched off when the car stop and re-starting when the car starts again saving fuel in the process. These batteries are 12 Volt Battery technology and are lead acid batteries and AGM batteries, this is because of the higher charging cycles that are available with different materials used in the making of the plates. 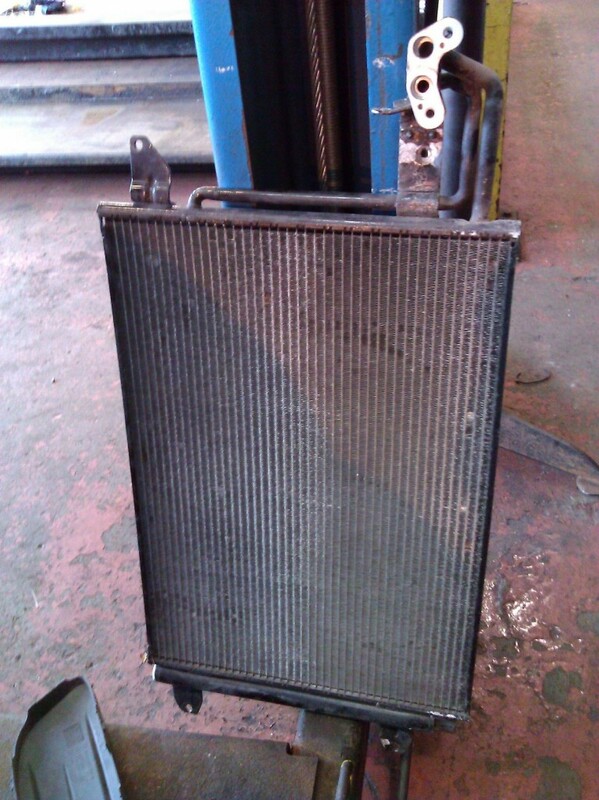 What do you think Eric Roberts..
Volvo air con condenser removed to fit a new “O” ring. miss. Many of our customers have had their cars serviced in preparation for their summer holidays, so the servicing side of the business can be a little slower this time of year. However, one of the things that have kept us going in this hot summer is the number of cars with Car Air conditioning systems that break or have never worked for years. 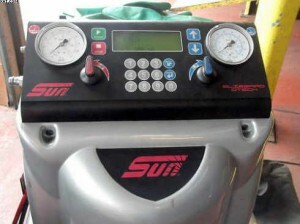 The hot weather makes them dig deep into their pockets and have the air con Operating Systems serviced or repaired. The cars that come to my garage with problems are usually older cars and some come to us complaining that they are having strong smells coming from inside the car. with a build-up of nasty’s in the evaporator located just behind the dashboard, this consists of molds, fungi and bacteria, that can cause some drivers to feel ill. This problem can be remedied by using an anti-bacterial spray which should get your car back to smelling fresh again. Unfortunately, the Car Air conditioning system in cars are not covered by warranty and the system will need servicing from time to time when the gas starts to deplete and the air con system stops working properly, leaving the driver hot and sweaty. For some reason motorists in the UK, where we have four seasons a year switch off their air con systems in the winter time. I do not think they know that you can run the air con and the car heater at the same time and also the smaller cars with the lower engine capacities will use much more fuel and so they switch the air con off. This result is that the system will dry out and start to damage some of the internal parts. Including small “O”, rings that act as seals within the air con system. These are normally lubricated by the “PAG OIL” that circulates within the system when the air con is in use. The consequences of this are the refrigerant gas that is confined to the system . So,will leak out through the broken “O” ring. Causing it not to work. To find where the leak is we have to re-gas the system . So,and try to find the leak with a special chemical .That we use to show us where the leak is and then repairing the fault. In fact, this was the case just the other day. A customer called into to see us with a problem with his Car Air conditioning. In fact, it was not working at all. The car was an older Volvo V40 and the customer always switched the air con off in winter. The car was five-year-old and so we started the process of re-gassing the system. So, in order that we could find out what the problem was. Indeed, we used our special leak detecting tool. Finding out the place where the gas had leaked more or less straight away. The problem was due to his air con system drying out. Breaking one of the “O” ring seals. This is a common thing with most cars. If the engines do not run then the hoses and other rubber parts will dry out and perish, because of no lubrication exactly the same as the air con system, the “PAG OIL” circulates in the system and oil all the parts when the system is running. The particular “O” ring was located in the high-pressure pipe part of the condenser which had to be removed and a new one fitted. Here at Pellon Autocentre can repair most models of cars air con systems in the Halifax area of West Yorkshire. Many other things can go wrong with air con but I will cover those when and if they happen in other blogs. The new “O” ring was fitted and the driver drove away much happier with his nice cool Volvo. Pellon Tyre and Auto-centre offer car and van servicing and repairs to all makes and models of vehicles. So, we are members of Unipart Car Care centres .Giving a nationwide guarantee for all our work and parts. Significantly, we also sell tyres online from our website www.pellontyres.co.uk . Finally, by using the tyre selector and choosing your tyre size. WIPER BLADES-Could Be a Thing Of The Past? “Ultrasonic Transducer” could replace them? Check your wiper blades, clean windows are a must in winter. Could this be the beginning of the end for Wiper Blades? Of course, when you fit a new set of wipers. Definitely test out the wiper blades before using them in real rain situations. Therefore,you can go to a car wash or spray your car down with a water hose. Of course then click the wiper switch. Hence, you have successfully install your new set of windshield blades if all goes well. Usually there is a locking mechanism that attaches the windshield wipers to the wiper arm. Of course, which is in turn, connected to the blade motor. Unlocking this portion will enable the old wiper to come loose. Consequently, all you have to do is snap the new one in place. Then lock the mechanism up again.Ensuring that the replacement wiper is secure. Just like anything else, the very best windshield wiper blades can be very expensive. Since there is usually a rainy season, possibly in winter and autumn. Of course, one can buy winter wipers for that one time of the year. Then wait until the next year to buy new ones. MODERN WIPER BLADES can be expensive? It is no secret that some of our jet planes do not have Flat Wiper Blades fitted, but use another method of clearing the winter weather from their windscreen. The windscreen is kept clean by an instrument called an “Ultrasonic Transducer” which sends ultrasonic sound waves across the windscreen surface that clears all screen from such things as snow and insects apart from the normal rain. Another added bonus to making the car lighter would be that the cars would not need a wiper motor and the cables and things that go with it. This would be great for use on today’s cars as it would also increase the effect a more efficient air flow, as the car is driven along, making the car more aero- dynamic and also more fuel efficient due to slightly less drag, as the screen would be cleared instantly all the time and not just when the Flat Wiper Blades were applied. I have a friend called Peter, who would not clear the windscreen until the very last minute that he could not see the road in front of him. This system would keep his screen clear all the time, thus reducing the chance of an accident happening because of the lack of vision. WIPER BLADES invented in the USA by a lady driver? Just for the record the Window Wipers blades that we use today were invented by an American lady, she was called Mary Anderson and the idea came to her whilst she was on a trip to New York, when she noticed that the early car drivers were sticking their heads out of the door windows, so that they could see where they were going when it rained. As a result, the first wiper blades were very simplistic. Just a metal arm device with a rubber blade. Operated manually by the driver. Thus, using a sort of lever inside the car. The invention was first thought of in 1903.By 1916 her invention became standard on all production cars in the USA. Only a year later in 1917 the first automatic wipers were invented by another lady in America called Charlotte Bridgewood, these were known as the (Charlotte Bridgwood’s “Storm Windshield Cleaner”). Charlotte invented this electric wiper system whilst she was the president of the” Bridge-wood Manufacturing company” in New York. The Mclaren super car maker to end the wiper blade. Rumours are rife that the McLaren car maker are considering are to introduce this type of technology into their new models, it would be great to see if this idea works, but not if you are a wiper blade manufacturer. Hi I would like to introduce myself. Working in the Garage and tyre and Battery business now for 40 years. Hence, I worked for a couple of national tyre companies. Of course, before starting my first business. Selling tyres online using www.pellontyres.co.uk . https://www.pellonautocentre.com/wp-content/uploads/2018/04/Four-Months-of-Snow-Forecast12-e1555564434682.jpg 230 438 Eric https://www.pellonautocentre.com/wp-content/uploads/2015/06/Logo_PellonCleanTrans.png Eric2019-04-20 05:19:402019-04-18 06:15:10WIPER BLADES-Could Be a Thing Of The Past? “Ultrasonic Transducer” could replace them? Yokohama Race day-Invite Ryan Linton from Pellon Tyres in Halifax to a Special Track Race Day Special. One the good things about dealing direct with the tyre manufacturers. So, is that from time to time we get a special treat. Of course,some sort of day out for the boss (usually a visit to their tyre factory). Or one of his key staff members, in this case Ryan Linton. Consequently, last year we decided to join an independent group of tyre buyers. Hence, known as Point-S. As a result, this enabled Point-S to build up a Nationwide Tyre Dealer set up. Enabling, small town tyre dealers. Like ourselves in Halifax UK . Thus,to buy direct from the tyre manufactures. Of course, who were previously not interested. In selling their products to individual tyre dealers. Such as ourselves. Naturally, this was a great opportunity for my business.We are now forming relationships with some of the Worlds top tyre companies. One of them is Yokohama from Japan, one of the Worlds finest tyre producers. Of course,the tyres that they make are second to none. Including, there quality and durability. As I say we are now very proud to be the Yokohama Tyre dealers for the Calderdale area including Halifax here in the UK. We were over the moon when we recently received an invitation to a Yokohama Race day, to attend a race day that they had organised at the renowned Bedford Autodrome, courtesy of Palmer-sport.com. This was a great treat for us ,but unfortunately the boss Eric Roberts was feeling unwell, (and he can’t drive fast anyway) so his place was taken by his chief mechanic Ryan Linton. I am sure that Eric will admit that he is a little old for driving racing cars and Ryan was the best choice anyway, Ryan has a great love and knowledge of all types of cars and loved the total experience from his day out with Yokohama Race day at Palmer-sports race day. Ryan testing his skills in the BMW M3 at a I would like to thank Yokohama Race day and Palmer-Sport from Ryan and myself for such a great day out (the weather was great too). We were also fortunate to have the full experience photographed and put on the their website, so that we can download some pictures of the day out. I would like to thank Yokohama Race day and Palmer-Sport from Ryan and myself for such a great day out (the weather was great too). https://www.pellonautocentre.com/wp-content/uploads/2015/06/Logo_PellonCleanTrans.png 0 0 Eric https://www.pellonautocentre.com/wp-content/uploads/2015/06/Logo_PellonCleanTrans.png Eric2019-04-20 05:19:402019-04-20 05:19:40Yokohama Race day-Invite Ryan Linton from Pellon Tyres in Halifax to a Special Track Race Day Special. Many of our customers are confused about having their car serviced at another garage. Consequently, when the car they own is still under manufacturers warranty. Customers think that they have to take their car back to the “main dealers” for any servicing or repair work. Of course, this is not true. As a result of legislation, then the UK and the USA have similar laws. Hence. that allow an independent garage to repair or service their car. However, it is a good idea to completely read through and understand your warranty. Learn the length of time and the number of miles the warranty covers. This is all common sense stuff. The Federal Magnuson-Moss Warranty Act which was passed in 1975. In the USA, this is a federal law put in place to protect consumers while purchasing a warranty. Through this act, the manufacturer is required to word the warranty’s contract so that car buyers can easily understand each condition of their vehicle’s warranty. Consequently, here in the UK then motorists are covered by a similar European Union law. Thus protecting the motorist from main dealer misinterpreting car warranties.As a result then the document is called “The right to repair campaign“. You, as a motorist in the EU. Are free to have your car serviced whichever garage you like. Naturally benefiting from the cost savings. As a result, the work can be carried out by an “independent garage”. Such as Pellon Autocentre, here in Halifax,UK . Subsequently, as long as that garage uses manufacturer approved parts or parts that are the same quality. Also, correctly following the manufacturer’s service schedule. Independent garages have much lower overheads than franchised dealers. So their hourly labour rate is also cheaper. There are a few myths surrounding automobile warranties that we are going to clear up for you . Especially, in the following article. Hence, once and for all. When an independent garage is repairing your vehicle. Of course, you are able to use the same quality parts other than the manufacturers. Some dealerships will tell you that this voids your warranty. This is an old trick of theirs and is not true. Therefore in any unlikely dispute. It will be the dealership’s responsibility to prove that it was another brand of the part. Thus, that caused the damage if there is a dispute. If you use a part from a brand other than your manufacturer when have your car serviced. Have your garage clearly write on the receipt the make and model of your vehicle. Also, along with the VIN number, speedo reading. Including, the date you had your car serviced. If needed, keep this for future reference. Of course a good quality garage will have this information entered on your receipt. Also filling in the manufacturers service book with any relevant information. A lot of people believe that you have to have your car serviced at the dealership for the manufacture warranty to be valid. The truth is you do not have to have your car serviced at the dealership to validate the manufacture warranty. General maintenance. “Does not have to be carried out” at your car dealership. So to keep your manufacture warranty valid and current. Tyres are just about the most important part of your car. caravans have good tread but suffer cracking on the bead area . Hence, this is due to aging. Of course, the age is located on the side wall of every tyre. Hence, you should know just how Old Are Your Tyres are . Of course, by a tyre date indicator,the one in the picture says 3011. This tyre in the picture was made on the 30th week and 11 means the year of manufacture 2011 so it was made in the 30th week of 2011 and so was 2 years old at the end of February 2013, well in date. The bead cracking on Touring Caravans tyres is due to the rays of the sun, which break down the carbon black that is part of the tyre compound mix. This is more of a problem when the caravan or motor-home has been stood on a site for a long time. When i was younger my wife and i lived on a mobile home whilst our house was being built. The part worn tyres were the small trailer type 400×8 was the size. Everything was fine until we started to move the caravan, when we sold it on. Then both of them shredded into pieces. On close examination we found that the tyres had deep cracking round the bead area, due to the effects of the sun. There is also another problem that is starting to raise its ugly head and that is that the second hand tyre dealers are not interested in How Old Are Your Tyres are that they sell to you, this is just another part of their scam. They want you to believe that the old worthless tyres that they are selling you are every bit as good as a brand new tyre, but please do not believe them politely move on to a reputable tyre dealer and buy a safe new tyre, you will be surprised how little difference that there is in the price, and you and your family will be safe, driving on a brand new tyre. The Michelin tyre in the image was 19 years old and had just been bought before the MOT test. The guy changed it with us for a new tyre and we damaged the tyre before scrapping it, just to make sure that it did not make its way onto the chain again. Pellon Tyre and Auto-centre offer car and van servicing and repairs to all makes of vehicles. Members of Unipart Car Care centres and give a nationwide guarantee for all our work and parts. Selling cheap car tyres from our website. www.pellontyres.co.uk by using the tyre selector. Choosing your tyre size. We offer courtesy cars to local motorists who need to go to work and leave their car with us for work doing. We are also an official MOT testing station and are members of Motor-codes, who carry out checks for high standard of equipment and workmanship. https://www.pellonautocentre.com/wp-content/uploads/2018/06/4C95692A00000578-0-image-a-4_1527157135208.jpg 382 636 Eric https://www.pellonautocentre.com/wp-content/uploads/2015/06/Logo_PellonCleanTrans.png Eric2019-04-19 05:20:002019-04-18 06:06:36How Old Are Your Tyres? Check the Made By Date They May Be Older Than You Think ? This time of year has been very kind to many garages.Up and down the United Kingdom (UK). Therefore,it may seem strange to people who live in other parts of the world. But here in the UK our Summers are very short. So,to be truthful we do not normally get much Sun. The new Skoda is an excellent car. Space is never an issue.Since there is sufficient room for both front and rear seat occupants. Therefore, it is designed in such a way that it will be a comfortable place to stay in. Controls are properly arranged including the Air conditioning controls.Numerous storage compartments are installed. That will on a hot day make staying inside comfortable. As a result, after our very cold and snowy March. I did not have much hope of us having good Summers. However, I was completely wrong? and this year has turned out to be hot and Sunny. Including a bonus for us garages. As a result, our customers have been roasting in their cars. Because, of the recent damp and rainy Summers, the motorists have been neglecting their cars Air-con systems and many did not work, giving us a golden opportunity to make a little more profit. I say little because of the fact that we are all still in hard times and the price of air-con has come down, here in Halifax. However, I decided to buy a new sign to put up in the garage, right at a set of traffic lights (very eye catching). The heat carried on from day to day, and air-con inquiries were coming in thick and fast. The only problem with air-con is that it takes about an hour to complete the cycle of checking and re-gassing, however, we did very well and most of our customers went away with a lovely cold car to drive in the 30c temperatures. I say most of the customers went away happy, because some did not. These were the ones with faulty air-con systems on their cars, including the driver of a 56 plate Skoda Octavia. He, unfortunately, had a faulty Air Con Condenser. This is the part that looks like a radiator and indeed does the same thing as the radiator. Instead of removing the heat from the engine it removes the heat from the Skoda Octavia and is hidden away, somewhere behind the dashboard in the Skoda Octavia. The air-con systems come in three main parts the condenser,compressor and evaporator all these combined take out the heat and humidity from your car. Air Conditioning Systems work by the compressor pressurising the gas, which is also the refrigerant and then moves into the Air Conditioning Condenser creating heat, as in the car radiator this flows through the very small condenser tubes cooling down the heat and forming into a liquid again, this circulates around the system, converting the heat from your car into cold air again, it is rather like steam turning back into water again, the system operates under high pressure and the refrigerant used cools the Skoda Octavia again, all clever stuff. Dale Linton one of my technicians was given the job of fitting the condenser and made the usual good job of it. The condenser was located behind the dash of the Skoda Octavia, making it a difficult task, with not much room to manoeuvre and working space was tight. Most air-con jobs work in very tight spaces. The job was completed and the customer went away in a nice cool car. Pellon Tyre and Auto-centre offer car and van servicing and repairs to Car Air Con Systems on all makes of vehicles. We are members of Unipart Car Care centres and give a nationwide guarantee for all our work and parts.